In the previous chapter, the COC algorithm was applied to elastic systems with a single deflection constraint and was illustrated with examples involving Bernoullibeams of variable width. The aim of this exercise was to show that iterative COC methods not only eliminate but also reverse the existing discrepancy between analysis capability and optimization capability. Since this study was primarily concerned with an optimizer, the repeated analysis of the structures under consideration was carried out by so-called FE-simulators (e.g. BAP) which were shown to generate exactly the same output as standard FE software (e.g. ANSYS), but several orders of magnitude faster. Although FE-simulators can handle only one given set of boundary and loading conditions, they are highly suitable for evaluating the optimization capability in test examples. Whilst present hardware and standard FE software cannot handle such large numbers of elements, the analysis capability of these is expected to keep on increasing in the foreseeable future. 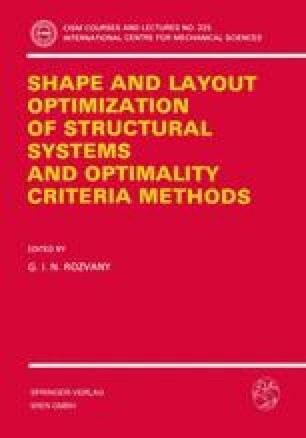 The COC algorithm, therefore, represents an optimizer that can easily handle not only present but also future needs in the optimization of large structural systems.